Now that we’re fully in winter’s grip, it’s time to get some hot pot, stat. Unsurprisingly, New York City is brimming with the Chinese and Japanese staple whether you’re looking to dine in Brooklyn, Queens, or Manhattan. All you have to do is grab a couple of your hungriest friends and sidle up to the ultimate brothy feast. Here’s where to eat hot pot in New York City right now. 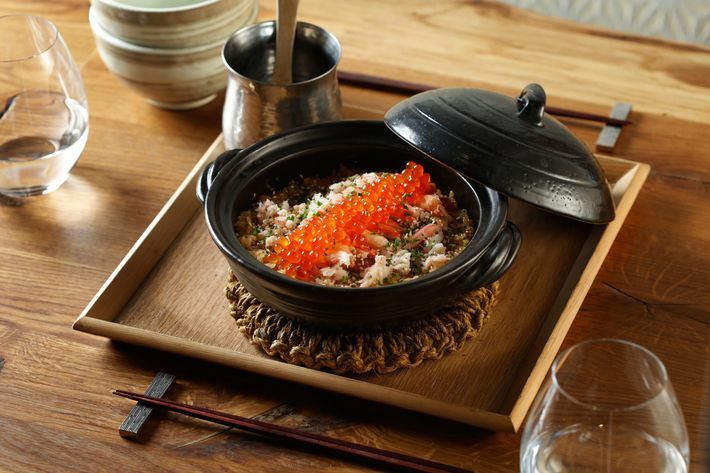 For the most part, sushi and sashimi are the name of the game at this midtown restaurant, but Mifune also happens to serve a killer Japanese hot pot rice dish featuring snow crab and ikura caviar. The dish serves two to three people so bring a group by and prepare to dig in. 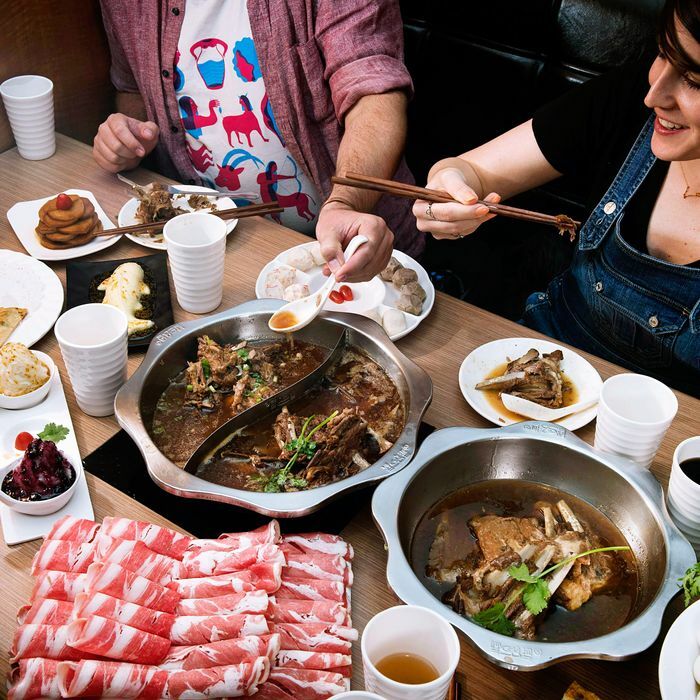 The beauty of this excellent chain of China-born hot pot restaurants is that it has outposts in Brooklyn (Sunset Park), Queens (Flushing), and Manhattan (Lower East Side). Sure, you have to put up with bumping EDM music, but it’s easy to tolerate when the food is so good. Think ridiculously fresh vegetables and thinly sliced meats, including the house specialty of lamb. Unlike many hot pot spots, the menu at Little Sheep is à la carte rather than all you can eat (though there is a $17 all-you-can-meat option). The restaurant also doesn’t take reservations for parties of five and under and there’s usually a wait, but that’s a small price to pay for some of the finest hotpot in the city. Like Little Sheep, this restaurant, with locations in Brooklyn and Queens, may look like a nightclub to those not in the know. But inside, diners will find traditional hot pot with non-traditional add-ons, including deli meat, cubed pineapple, and bacon-wrapped mushrooms. Your best bets here are the full-bodied pork bone broth and a spicy seafood broth that won’t disappoint those who love a little heat. Finally, a hot tip, don’t drop by before 3 in the afternoon, because this spot won’t be open. Better to come for dinner or a late-night feast. While there’s some pretty good hot pot in Chinatown, the absolute best hot pot can only be found in Flushing, Queens, at Lao Cheng Yi Guo. As our own Chris Crowley points out, the Sichuan pepper-seasoned lamb stew with chrysanthemum greens and baby bamboo is worth the trip on the 7 train alone. But throw in some egg crepe dumplings and hand-pulled noodles for a truly unforgettable feast. Among the places on this list, any one of 99 Favor’s five locations is your best bet for celebratory gatherings (even better, if it’s your birthday, you eat for free). There’s no EDM to worry about, ample room for large parties, and the option of adding Korean BBQ to mix if hot pot isn’t enough. Hot pot broth choices include spicy, tomato, original, kimchi, pig bone, and Chinese herbal, and there is a limited but respectable selection of add-ins, including lotus root, tofu, onions, shrimp, and more. The quality of ingredients isn’t always on par with à la carte restaurants, but at just $24 per person for all you can eat, that fact isn’t exactly a deal-breaker. This newest entrant to the hot pot scene arrived in September, taking over the spot once occupied by Congee Bowery and co-owned by the son of Congee Village owner Peter Liang. Accordingly, Zhen Wei Fang is a generational improvement on the hot pot concept: There are live lobsters available, meat options include AAA New Zealand lamb and USDA certified prime rib eye, and the restaurant grows its own mushrooms. It’s on the pricier side (think $80 for Wagyu beef), but worth the trip for those interested in checking out the luxury side of hot pot. If you’re grabbing dinner with a hot pot newbie, Tang Hot Pot in Chinatown is a great place to help them get their sea legs. The restaurant’s menu doesn’t veer too wildly off the beat and even features a guide with instructions on not only how long each ingredient takes to cook, but what order they should be cooked in (leafy greens and tough vegetables first and noodles last). Even better, bring a group along to take full advantage of the available combo platters, which include a meat lover’s spread with ten different kinds of protein, and the Sichuan Adventure platter, which features offcuts like pork artery, beef tongue, and chicken gizzards. For more than two decades, this East Village spot has faithfully served two types of Japanese–style hot pot. There’s the more standard shabu-shabu, where guests order proteins served with hakusai cabbage, scallions, carrots, shiitake mushrooms, watercress, tofu, kishimen noodles, and shirataki noodles in a house broth. Then there’s the even simpler but equally delicious nabemono hot pot, which is lighter on the palate and involves all the ingredients being cooked together like a stew. In other words, if decision-making isn’t your strong suit, Shabu-Tatsu is the place to go.